“There is enough circumstantial evidence to the alert the international community to what amounts to genocide.” – European Parliament Vice President on reports of Falun Gong practitioners being killed so their organs can be sold for transplants. Falun Gong, otherwise known as Falun Dafa, is a spiritual practised based on a combination of ancient oriental philosophies including Buddhism and Taoism. Truthfulness, kindness and tolerance are its three pinnacles of belief. It has no formal organisation or leader. Practitioners focus on meditation to find harmony between the mind and body and look inside themselves for spiritual fulfilment. It can benefit physical as well as mental health. Since July 1999, the Chinese Communist Party has been condemning the practice as an “evil cult.” It was branded illegal. The millions of people who had found solace in the practice since the early 1990s were persecuted. Slanderous propaganda was circulated to schools and the public, and a process of “re-education” was announced by the CCP. These terrifying Orwellian tactics continue to this day. A growing body of evidence shows that China are using prisoners of the Falun Gong practice to fatally harvest organs from, which are sold on for profit. China does not have a formal transplantation system, so the huge amount of organs that they provide to national and international patients each year is unaccounted for. In the past they have harvested organs from executed prisoners, however the total is kept a secret. This week we were visited by Yuyu, who returned to Amnesty to raise awareness of this issue. 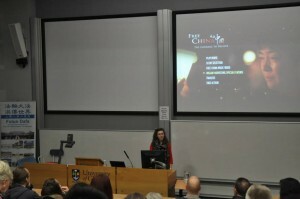 She screened a film entitled “Free China: The Courage to Believe” which details the stories of two campaigners who are fighting against the punishment of their spiritual practice. Jennifer Zeng is a former Communist Party member who went through a year of testing before being allowed to join the Party. She was convinced that it would give her a leg up in society. After the birth of her first child, she was forced to abort her second due to the one-child policy. Her health suffered. When she found Falun Gong, however, she felt transformed – she says learned to stop trying to control other people and to only control herself. Then the CCP which Jen was loyal to, who actively promoted the practice initially, turned against it in a drastic move. Falun Gong practitioners at that point outnumbered Party members. The widespread dedication to it went against state values of Marxism and atheism, first enforced by Mao in 1949. What was once such a positive thing for China lost its influence in a heartbeat. The CCP essentially run a totalitarian regime which does not tolerate anything which will pose an ideological threat to its motives. People found and benefited from spirituality in a country which prioritised consumerism and commercial gain in the 20th century. Jennifer was arrested for attending a Falun Gong gathering in 2000 and sentenced to one year in a forced labour camp. Police used force and electrocution and humiliation to control her, and she was denied an appeal. In the camps, prisoners work for hours each day making consumer goods such as hand-knitted sweaters. Jen even made toy rabbits for the Nestle chocolate company. All were exported to the West. Charles Lee is an American-Chinese businessman who practised Falun Gong. When he heard about the prosecutions, and the way that the internet and media were being used to survey the “crime”, he felt compelled to return to his native country from America. Charles attempted to intercept TV channels and broadcast pro-Falun Gong information. However, he was forced to flee the country after a near miss with the police. When he returned to China a year on, he was arrested at the airport. In jail he went on near-fatal hunger strike. His case became a study for the US Congress as they began to address the issue. Those held in labour camps for their spiritual practices are forced to display reform before they are released. Jen did this so that she could continue the fight outside. It was an extremely difficult thing to do, particularly when she was held up an as example to others who shared her beliefs. After release, Charles and Jen were eventually reunited with their families in different parts of the world, and continue the fight for the protection of Falun Gong practitioners. 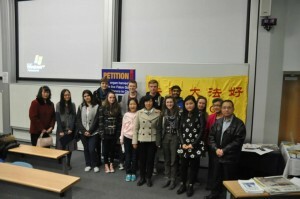 Joining Yuyu was lawyer Mrs Grace Xu, who spoke to us first-hand about her experience. She found the healing properties of Falun Gong through a roommate at university, well into the 2000s and years after the CCP launched their attack. After a decade of practising Falun Gong, Grace was arrested on her doorstep one morning. She tried to relate to us how brutal life was in the camp she was sent to, and how difficult it is for us to imagine, living in a free democratic country like the UK. She was transferred to a camp reserved for Falun Gong practitioners. Now seeking asylum in the UK, Grace has not seen her daughter for two years. Yuyu expressed her happiness at the turnout to the event, saying that growing up in China she was faithful to the CCP and shielded from human rights issues. Only when she left did she become aware of what is hidden. Zoom out of the personal pictures, and what is being done globally? The internet has been a big hurdle in the battle between the CCP and campaigners. China censors everything online; however, people out of surveillance’s eye have managed to intercept the “Great Firewall” to provide safe and true information about Falun Gong, available without trace to Chinese internet users. 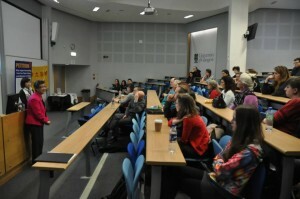 Ethan Guttman, a human rights investigator and China analyst, gave a talk at Amnesty’s annual Student Conference in Edinburgh this month, which committee members Ali and Maisie attended. He is currently completing a history of the clash between Falun Gong and the CCP. He estimates that approximately 65,000 Falun Gong adherents may have been killed for their organs between 2000 and 2008. Doctors Against Forced Organ Harvesting started a petition to the UN last year, urging them to “call upon the Chinese government to immediately end the brutal persecution of Falun Gong, which is the root cause for the forced organ harvesting from Falun Gong practitioners.” It received over 1.5 million signatures in less than 5 months. The European Parliament also passed a motion last year condemning the practice. As Yuyu said, these steps are all positive, but the bureaucracy that must be broken down before real change is made means that campaigning is still as vital as ever. Read recent article from EP Vice President: http://fofg.org/2014/01/we-recall-the-holocaust-we-should-recognize-genocide-in-china-today/ (this website also has information about how Falun Gong has been banned in Russia).